LOS ALAMOS, New Mexico, June 27, 2011 (ENS) – Fire crews have contained a wildfire in a remote outdoor area of Los Alamos National Laboratory, which is responsible for ensuring the safety, security, and reliability of the nation’s nuclear weapons. Emergency officials say the Las Conchas fire, which had burned to the southern edge of New Mexico State Route 4 at the lab’s southwest boundary, crossed the road to the north early this afternoon. Air crews dumped water at the site within the lab’s Technical Area 49 and brought the fire under control. The wildfire forced a shutdown of the Los Alamos National Laboratory today and the lab will remain closed on Tuesday. The city of Los Alamos is under a mandatory evacuation order. Lab officials said in a statement today, “All hazardous and radioactive materials remain accounted for and are appropriately protected, as are key Lab facilities such as its proton accelerator and supercomputing centers. Environmental specialists are mobilized and monitoring air quality, but say the principal concern is smoke. A plume of black and grey smoke was visible as far away as Santa Fe, 35 miles to the southeast and also in Albuquerque, 98 miles to the south. Technical Area 49, where the fire entered Los Alamos National Laboratory property, is used by the lab’s Hazardous Devices Team as a training area and as an isolated location for blowing up suspect packages. The site is also the location of the laboratory’s Antenna and Pulse Power Outdoor Range User Facility, where outdoor tests are carried out on materials and equipment components that involve generating and receiving short bursts of high-energy, broad-spectrum microwaves. TA-49 is surrounded by a locked security fence, which prevents accidental intrusion. When experiments are conducted, personnel install barriers that exclude unauthorized individuals from access to areas where unsafe levels of energy could be encountered. Laboratory officials said tonight that the area had been thinned of ground fuels in recent years. “Environmental sites are being monitored and air quality experts are coordinating with the U.S. Environmental Protection Agency,” the lab stated. 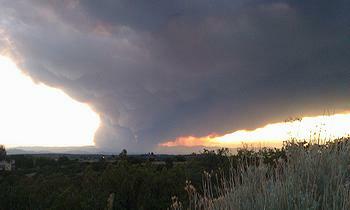 The Las Conchas fire started on private land at 1:00 pm Sunday. Red flag conditions – hot temperatures, low humidity and high winds – contributed to the intense fire behavior and rapid fire growth, fire officials said today. The wildfire is burning in the Jemez Ranger District, Santa Fe National Forest, about 12 miles southwest of Los Alamos. The flames have charred 43,597 acres in forests, canyons, and mesas to the south and west of the national lab. The town of White Rock remains under voluntary evacuation. Cochiti Mesa, Las Conchas, Bandelier National Monument, and campgrounds near the fire were evacuated Sunday. About 100 residents evacuated from Cochiti Mesa and Las Conchas. Power and phone lines are down in the area. The Bandelier National Monument will be closed for at least three days due to the fire. The cause of the Las Conchas fire is unknown; it is under investigation.